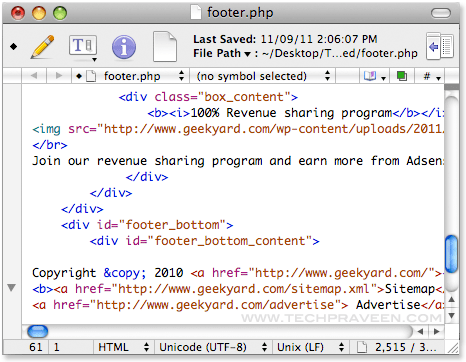 I mainly use TextWrangler to edit PHP codes to customize the WordPress themes. Like Notepad++, it provides lots of features which makes life easier. Syntax coloring and function navigation for ANSI C, C++, Fortran, Java, Object Pascal, Objective-C, Perl, Python, Rez, Ruby, Tcl, TeX, and Unix shell scripts. Product developed in the best traditions of Bare Bones Software. It comes with high performance, ease of use, a rich feature set, and the ability to read its own release notes. A good text editor can greatly improve your productivity and TextWrangler is a Mac OS X word processor that certainly seems fit for the job. The app come with a minimalist design but also provides a plethora of useful tools for writing, editing and transforming text. A Mac OS X text processor that comes with extensive search and replace capabilities, syntax coloring tools, FTP/SFTP support and more. To conclude, the plethora of tools and functions packed within TextWrangler will certainly make the application a great addition to your software collection. Thanks Praveen for posting this. Is this only limited for Mac? I hope there’s text wrangler for Windows too! Thanks for posting this. I think I will try this. I should recommend this text wrangler to my cousin. She just bought a new Mac laptop. She wants to engage in online marketing too. Besides other excellent features of Mac this Text wrangler will add up on one of text editor.